It is funny how over time the memory of physical pain subsides but the mental highlights remain vivid. There are very few opportunities to do something on a motorcycle that no one else has ever done. Regardless of the fact that it is something terribly obscure and no one else would really want to do it anyway. When Jimmy Sones and I crossed the mountain range in Baja in December 2012, it was mostly based on a huge leap of faith. The shear belief that we could do it. It was a rugged time that included an impromptu overnight camp out. We pushed ourselves right to the very limit, but came out without any real damage, just cold, tired and thirsty. At the time I figured I would never do that trip again. It was just too remote and physically demanding. Besides, who would I go with? Very few of the riders who asked me about it in earnest could understand just how hard and precarious the trip was. But as a few did ask about it, it got me thinking about the mountains that had never seen a tire track once more. Now that I had done it once and knew the exact route, perhaps it would be easier the second time around. Jimmy and I were just going off the best route idea we could plan out from the map and satellite images. It was the crew from Hawaii that really got me started back on the idea a year later. 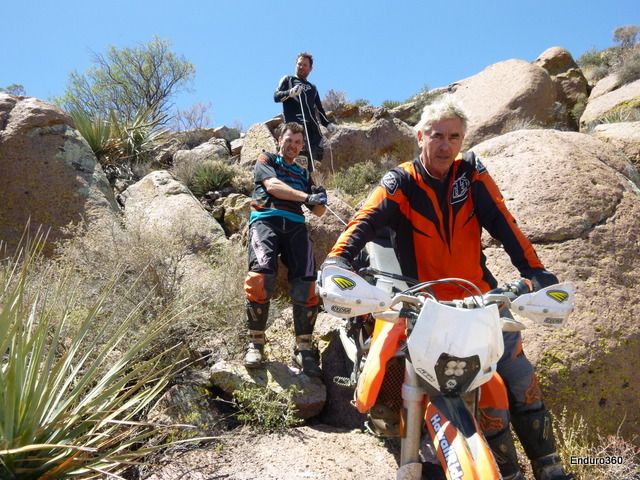 I had already ridden with them in Baja for a long tour, plus a few days on their terrain in Oahu. They were are solid riders and could take care of themselves and their equipment. As we started talking about the idea I threw out a number of hurdles, things that I would require before considering the trip to the mountains again. They didn’t balk at any of them. As the trip plan started to come together, I wanted to make sure we were as prepared as possible. For the bikes, it would require carrying 4 gallons of fuel, mousses for everyone and good lights. I didn’t want to waste any time fixing flats or bikes. Equally, I explained to everyone that there was always a chance that we might have to abandon the crossing. There would be one specific place were we would have to make a go- no go decision and if for any reason the conditions looked unfavorable, I would make the call not to proceed. The crew from Hawaii arrived; Sam, Mark and John. We spent a day prepping all the bikes. We would have 2 350exc’s, a 450exc and my 525mxc. We left for Mexico late in the afternoon and did a casual ride to Ensenada for the night. We had a full week set aside for this trip, so we would be able to get few good days of riding in as we headed down south to El Rosario. The most notable part of the first days was the “brake pad” incident, but I will leave that for another story. The ride plan would be to leave El Rosario at daylight and hopefully arrive in San Felipe before dark. The night before we did all the preparations. All of the bikes had a good fuel range, but I was not exactly sure just how much we would need. On the first trip we had driven down the highway to start the ride and we really did not keep track of the total mileage. I had used the six gallon tank which was way too much because it made the bike very hard to handle when the going got really bad. But with the added mileage I still wasn’t sure that four gallons would be sufficient. Just to be safe, we strapped a couple of extra gallons of fuel on for the start. We could dump it quick enough anyway. Each rider started with a full 100 oz. of water also. On the original ride we ran out of water and that made for a very long night. In addition I now carry a filter straw with me, so we can drink from almost any source. We were up and getting dressed before the sun came up. A quick cup of coffee and a Kate’s bar were all we had to start the morning before we hit the highway. It would be a 35 mile liason before we hit the dirt. I had the GPS track to navigate the long series of dirt roads that would lead us well back into the mountains. Fortunately the weather was perfect. Just two weeks earlier riders had told us of having to abandon their ride plans in the same area due to temperatures well over 100 degrees. As we headed east and slowly climbed the slopes upward, the riding was wonderful. 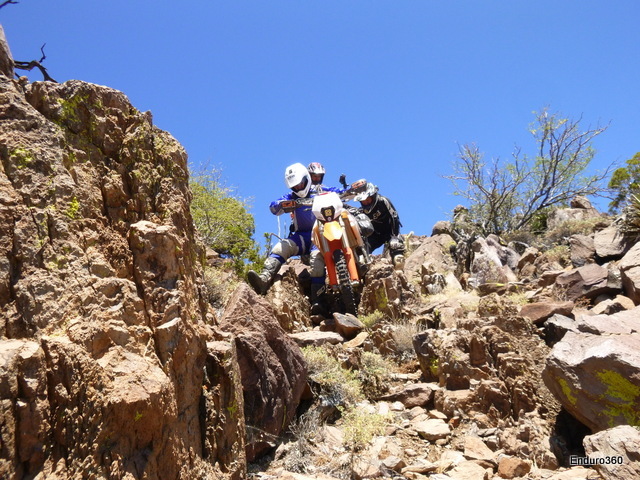 One of the consistent joys of Baja riding is going places where few others venture. But even here the situations change constantly. We passed one active mine and encountered some ranch workers far back in a canyon. I stopped and had a quick pow-wow with the workers. Leaving them with a small bottle of tequila and a smile, we wandered on. It is times like this that speaking passable Spanish pays its dividends. Now we were well past any sign of life and the road is slowly being reclaimed by nature. But the scenery was fantastic too. As we climbed higher, the views became even better. Finally we reached the top, our jump off point for the decent to the east side, the San Felipe area. So far the travel had been smooth and we arrived earlier than expected. At this elevation the temperature was slightly brisk and invigorating. After a quick view over the edge. I pointed out the route and what lie ahead to the rest of the group. Everyone was eager to get started, so off we went. For the first mile or so, the route is rideable. But to say that is somewhat deceiving too. The ground is nothing but rock and cactus. There is practically no dirt. Even the smallest tip over could become very painful. Once over the edge, down the east slope, there is no possibility for return. The next few hours would not only be very physically demanding, but would also require absolute concentration to keep away from harm. Just after starting our descent, we jumped a large Big Horn ram, or a Cimmaron as the locals call them. He was spooked at first, but once he ran off a distance, stopped to watch us. We would catch a few more glimpses of him as he eyed our progress. It immediately dawned on me how much of an advantage we had this time, using a known GPS track. On the first trip Jimmy and I were going blind over the edge of the world. One of my goals with the second trip was to see if we could scout some better lines to make the descent easier. As it turned out, such was not the case. There is only one way down and at times it is brutal to both bikes and riders. With four of us for muscle, it was much easier to get the bikes off the first ledges. Yet it was still a considerable task and before long my arms were starting to strain. With one rider in front, one in the rear and one at the bars, we could walk each bike down the first rock chute. For the first hour or so it was a combination of riding and bulldogging until we reached the first section requiring the rope. We looked for alternate routes down, but all proved to be shear drops. With all hands on each bike, we got them down safely over the rocks. Two hours into the descent we came to the second section requiring the rope. Here the terrain was much steeper. But we put together a little conga line and got the bikes down without too much effort. After that the mountain slope continued to grow steeper. There was always a real concern about a motorcycle getting out of control and simply tumbling its way down the mountain. Some of the terrain was almost too steep to walk. At times it was just a matter of trying to keep a controlled slide going in the loose gravel while walking along with the bike. More than once I wondered if someone like Graham Jarvis could simply ride down this stuff. Having seen some of the things they do in extreme enduros, I have to think so. The right rider might ride down much of this in a few minutes, instead of the hours we needed. I could really feel myself starting to get tired now. The constant strain was taking a toll. There were more places where we needed multiple hands on each bike to make sure it did not tumble away. That meant climbing back up to get each bike too, almost as difficult on its own. But as the bottom of the mountain came in sight, I felt good about our progress. ” Almost but not quite” – my fun meter gets pinned and the end is still not in sight.